Updated 5/1/18 Please link to, use to educate and share. Executive Summary Material Summarized from Wikipedia' s History of Iran. 1901 D'Arcy Oil Concession given British effective control of Iranian oil reserves for 60 years. 1905 The Iranian Constitutional Revolution, 1905-1911, the first such event in the Middle East, heralded the modern era. 1921 Iran's constitutional monarchy fails when RezaKhan Mirpanj uses Russian-trained troops to force government to resign. when a military coup d'état, supported British and US intelligence, forced Mossadegh from office. The Shah returned to power. half the profit from its oil to run the Iranian oil facilities for 25 years. Iran was not allowed to audit consortium accounting records. 1970's Widespread religious and political opposition to the Shah's rule and programs caused him to flee Iran on January 16, 1979. President Reagan ended the crisis on January 20, 1981, the first day of his presidency, when he agreed to most Iranian terms. the Soviets, China, France and others. Regan Administration covertly sold anti-tank missiles and spare parts to Iran. see Iran-Contra affair. Iran, the modern nation state, was formed as Persia underwent a revival under the Safavid dynasty (1502-1736). Some historians have credited this dynasty with founding the modern nation-state of Iran by giving her a contemporary Shia character and because significant segments of Iran's current borders take their origin from this era. A faltering Safavid court eventually gave way to the conqueror Nadir Shah (1736-47), who restored order and implemented policies for safekeeping the Iran's territorial integrity. This Afsharids dynasty was followed by the Zand dynasty, founded by Karim Khan (1750-1794), and later the Qajar (1795-1925) and the Pahlavi dynasties (1925-1979). By the 17th century, European countries, including Portugal, Great Britain, Imperial Russia, and France had colonial footholds in the region. Iran lost sovereignty over many of its provinces as a result of the early 19th century Russo-Persian War. Control of Persia and her supposed oil reserves remained contested between the United Kingdom and Russia . In what became known as Anglo-Russian Convention of 1907 accord signed between Great Britain and Imperial Russia, Britain proposed to partition Persia into two distinct "spheres of influence" with the north awarded to Czarist Russia and the south to Britain. The central area was to be a "buffer" or "neutral zone". The Accord, which had 5 articles, was signed without the participation or knowledge of the Persian government, and was eventually met with a bitter response from Iran's parliament. Iran was officially informed of the Accord later, on September 16, 1907. The Accord also involved the fate of Afghanistan and Tibet. This Accord was not unrelated to the 1919 Treaty signed later on. the course of the Revolution, and all were ultimately changed by it. essentially neutral. In 1919, Britain attempted to establish a Iranian protectorate. at control and pushed to have the country developed. The 1901 D'Arcy Oil Concession gave 60 years of control over Iranian oil reserves to the Britain. Editors' Note: Shah received 16% of profits to be calculated by D'Arcy Oil. See William Knox D'Arcy. 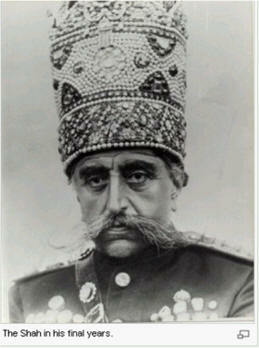 Shah Mozzafar-al-Din Shah Qajar was responsible. The Shah, a Turkmen descendent, was deeply hated by the Iranians. Within a few years, D'Arcy was almost bankrupted by the cost of oil exploration and sold his interest to the Burma Oil Company Ltd. Later to be British Petrolium or BP.. The 1908 discovery of oil by the British in Khuzestan was followed in 1909 by the creation of the Anglo-Persian Oil Company. APOC was the first company using the oil reserves of the Middle East. Volume production from a refinery built at Abadan started in1913. APOC took a 50% share in a new Turkish Petroleum Company organized in 1912 by Calouste Gulbenkian to explore and develop oil resources throughout the Ottoman Empire. APOC controlled all Iranian oil and was renamed the Anglo-Iranian Oil Company (AIOC) in 1935. By 1950, Abadan was the world's largest refinery. In spite of diversification, AIOC relied on Iranian oil fields for three-quarters of its oil. It was named the British Petroleum Company (BP) in 1954. After WWII, there were hopes that post-occupation Iran could become a constitutional monarchy. The new, young Shah, Mohammad Reza Shah Pahlavi, initially took a very hands-off role in government, and allowed parliament to hold a lot of power. Some elections were held in the first shaky years, although government remained mired in corruption. Parliament became chronically unstable, and from the 1947 to 1951, Iran saw the rise and fall of six different prime ministers. a nationalist, tried in 1951 to nationalize the British-owned oil industry. A military coup headed by retired army general Fazlollah Zahedi succeeded and Mossadegh was forced from office. The Shaw, in return for US support, signed a 1954 twenty-five year contract with Britain (40%), America (40%), France (6%), and the Dutch (14%) to run the Iranian oil facilities. A fifty-fifty split of profits was agreed upon, but Iran was not allowed to audit consortium profits reports, nor were they allow to be on the consortium's board of directors. Stability returned in the late 1950s and 1960s. In 1957, 16 years of martial law ended and Iran became closer to the West. She joined the Baghdad Pact and received U.S. military and economic aid. The Iranian government began a broad modernization program, notably changing the quasi-feudal land system. Economic growth proceeded at an unprecedented rate, fueled by Iran's vast petroleum reserves, the third-largest in the world. However, the reforms did little to improve economic conditions and the Shah's liberal pro-Western policies alienated certain Islamic religious and political groups.. Widespread Religious and political opposition, headed by the Ayatollah Ruhollah Khomeini (who had been exiled in 1964), were becoming increasingly vociferous. The Premier, Hassan Ali Mansur, was assassinated in 1965. The internal security service, SAVAK, became more violently active. During this period, it is estimated that 13,000-13,500  people were killed by the SAVAK and thousands more were arrested and tortured. Relations with Iraq fell into a steep decline, mainly due to a dispute over the Arvand waterway given to Iraq by a 1937 agreement. The U.S. embassy in Tehran was seized by Militant Iranian students on November 14, 1979. Fifty-two embassy employees were held hostage for a 444 days. U.S. economic sanctions were imposed on April 7, 1980. A United States rescue attempt, Operation Eagle Claw, failed and caused the deaths of eight servicemen. Historians have called this crisis the primary reason President Carter lost his 1980 re-election bid. Finally, Ronald Reagan ended the crisis on January 20, 1981, the first day of his presidency, by agreeing to nearly all the Iranian terms. Iraq invaded Iran on September 22, 1980. Lasting from September, 1980 to August 1988, it has been called "the longest conventional war of the 20th century." It cost 1 million in casualties and US $1.19 trillion. The causes were a long history of border disputes, Iranian demands for the overthrow of Saddam Hussein's regime, and secret encouragement of Iraq by President Carter. This encouragement was conveyed through Saudi Arabia, which was embroiled in a dispute with Iran's new regime. 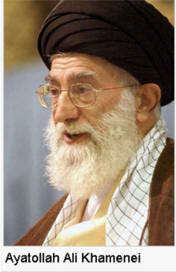 The United States was wary of the Tehran regime because of the 1979 Iranian Revolution and the Iran hostage crisis. Starting with1982 Iranian battlefield success, the U.S. made its backing of Iraq more pronounced by supplying it with intelligence, economic aid, weapons, and reinstitution of normal relations (they had been discontinued during the 1967 Six-Day War. President Ronald Reagan decided the United States "could not afford to allow Iraq to lose the war to Iran", and the United States "would do whatever was necessary and legal to prevent Iraq from losing the war with Iran." During the early years of the war, Iran's military arsenal was substantially American made, left over from the Shah's Royal Armed Forces. Iran's foreign supporters gradually came to include Syria and Libya, through which it obtained Scud missiles. She purchased weaponry from North Korea and China, notably the Silkworm anti-ship missile. The Regan Administration covertly sold anti-tank missiles and spare parts to Iran for its Shah-era U.S. military systems. This was done indirectly through Israel and then directly. In exchange it was hoped Iran would persuade several radical groups to release Western hostages. This did not happen and proceeds from the sales were diverted to the Nicaraguan Contras. This became known as the Iran-Contra Affair. Iraq's weaponry had been purchased from the Soviet Union and its satellites the preceding decade. During the war, it purchased billions of dollars worth of advanced equipment from the Soviet Union, France, China, Egypt, and Germany. Western countries, among them United Kingdom, France, Spain, Italy, and the United States, provided Iraq with biological and chemical weapons technology and the precursors to nuclear capabilities. In 1973, the Shah returned the oil industry to national control. Following the Arab-Israeli War of October,1973, Iran did not join the Arab oil embargo against the West and Israel. Instead, it used the situation to raise oil prices, using the money gained for modernization and to increase defense spending and become the region's strongest military power. Economic improvements instituted in the 1960's benefited a small group and succeeded in disaffecting most of the population. As a result, widespread religiously led protests occurred during the late 1970s. There was widespread religious and political opposition to the Shah's rule and programs--especially SAVAK, the hated internal security and intelligence service. Martial law was declared for all major cities in September of1978 (see Black Friday (1978) . 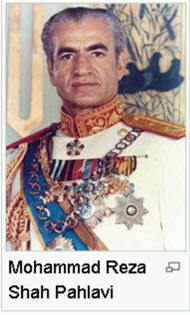 The Shah recognized the erosion of his power-base and fled Iran on January 16, 1979. He had been a strong ally of America since World War II and was one of the "twin pillars" upon which U.S. strategic Middle East policy had been built. Though President Carter praised the Shah as a wise and valuable leader, when a popular uprising against the monarchy broke out in Iran, the U.S. did not intervene. The Shah was subsequently deposed and exiled. In 1981, the Mujaheddin-e-Khalq detonated bombs in the head office of Iran's Islamic Republic Party and the Premier's office killing 70 high-ranking Iranian officials, including Iranian President Mohammad Ali Rajai, Prime Minister Mohammad Javad Bahonar, and Chief Justice Ayatollah Mohammad Beheshti. On July 3, 1988, the USS Vincennes shot down Iran Air Flight 655 en route to UAE killing the 290 people on board. an elected body of senior clerics — chose the outgoing president of the republic, Ayatollah Ali Khamenei, to be his successor as national religious leader. It proved to be a smooth transition. 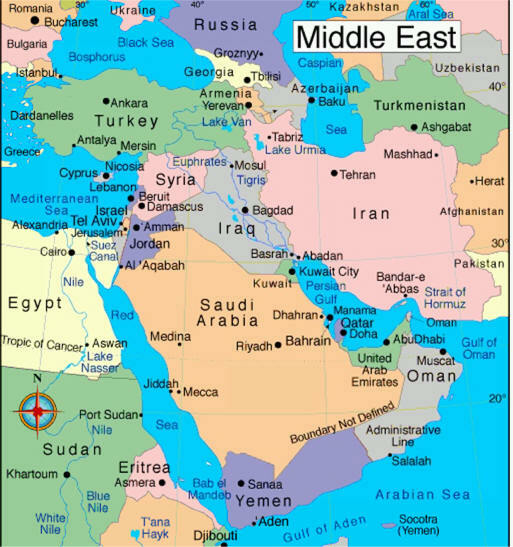 During the 1991 Persian Gulf War, the country remained neutral, restricting its action to the condemnation of the U.S. and allowing fleeing Iraqi aircraft and refugees into the country. than resounding majority and some Western observers attributed the reduced voter turnout to disenchantment with the deteriorating economy. Rafsanjani was succeeded in 1997 by moderate Mohammad Khatami. His presidency was soon marked by tensions between the reform-minded government and an increasingly conservative and vocal clergy. In July of 1999, tensions climaxed with a massive anti-government protests in the streets of Tehran. Police and pro-government vigilantes took over a week to dispersed the crowds. Khatami was re-elected in June of 2001, but his efforts were repeatedly blocked by the religious Guardian Council. Conservative elements within Iran's government moved to undermine the reformist movement. They banned liberal newspapers and disqualified candidates for parliamentary elections. This clampdown on dissent, combined with the failure of Khatami to reform the government led to growing political apathy among Iranian youth. Mahmoud Ahmadinejad, an ultra conservative was elected the sixth president of the Islamic Republic of Iran in 2005. The election had 1,000 candidates disqualified by the Guardian Council. 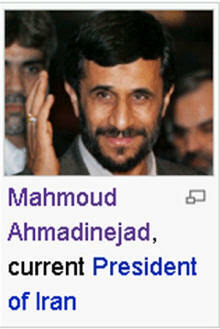 Mahmoud Ahmadinejad was a member of the Central Council of the Islamic Society of Engineers. He had a powerful base inside the Alliance of Builders of Islamic Iran (Abadgaran) and is considered one of their main figures. Ahmadinejad, a controversial figure, has been criticized by Western governments for his statements that Israel should be "wiped off the map", support of Hezbollah, controversial comments he has made about the Holocaust and the legitimacy of Israel's existence. Iran has superseded the US as the most influential power in Iraq, according think tank Chatham House, also known as the Royal Institute of International Affairs. Iran views Iraq as its own backyard and this affords her a key role in Iraq's future. It also said Tehran had an unparalleled ability to affect stability and security across most of Iraq. In September, 2006, analysts pointed out that the empowerment of a Shi'a majority in Iraq has been responsible for this increase in Iran's influence. This influence, analysts say, is particularly strong in the mainly Shia south, where a top Shia leader wants an autonomous Shia region.